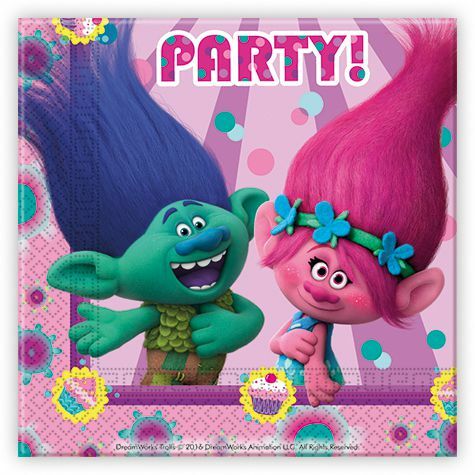 Trolls Paper Party Napkins are the ideal addition to any Trolls Birthday party theme. Girls are going crazy for them as are the boys too. Trolls the hit film from Dreamworks in 2016 and kids are still mad about it from 2017 onwards. Some massive hit songs in the movie such as hair up. The paper napkins are colorful and a great look for your trolls table decor. These Napkins include the characters Poppy and Branch, and they are surrounded by Troll Cupcakes to finish them off. These are a great bonus when used with Trolls Plastic Cups and Trolls Party Plates. The Napkins when opened are 13inches by 13inches (13″ x 13″) ideal for placing over the party plate. You could also choose some pink plain plates and put these over the top to save a bit. New animation was used in the creation of the film. When you see the movie in 3D, you will be able to see “texture” in the animation.